OCEANSIDE (CNS) - An attempted murder of a peace officer conviction was overturned Friday for a man accused of intentionally running down a motorcycle officer during a routine traffic stop in Oceanside, after an appellate court ruled that his attorney ignored the defendant's argument that he was innocent of the crime. Roberto Ignacio Flores was sentenced to 29 years to life in prison for allegedly running his car into Oceanside Police Officer Brad Hunter on June 19, 2017, leaving the officer hospitalized with life-threatening injuries that kept him out of the field for just over six months. While Flores contended that he was not the driver of the Dodge Neon that struck Hunter, Flores' attorney, John Wilshke, argued at trial that Flores was the driver, but did not have the intent to kill required for an attempted murder conviction. Flores also disagreed with his lawyer's concession on weapons possession charges related to a collection of guns found at his home. A three justice panel ruled Friday that Flores' sixth amendment rights were violated, as he was not allowed to present the defense of his choice. "Obviously we are very disappointed in the decision by the 4th DCA but confident that a retrial will result in another conviction - Attempted Murder of a Peace Officer - and the appropriate sentence. It's a shame our justice system indulges games such as the ones he is playing - subjecting the victims of horrific crimes like this one to further emotional distress and further wasting the tax payers money but we are confident that justice will ultimately prevail." "Regardless of the court’s decision, it is our continued hope that Flores is brought to justice for the willful assault on Officer Hunter." Trial prosecutor Keith Watanabe, who said he is preparing for a retrial, described the defendant as "very dangerous and evil" and said Flores "bragged about striking the officer and putting him in a wheelchair." "We are disappointed by the ruling. When Flores was sentenced to 29 years to life in prison, we believed justice was served and that we would never have to see him again. Unfortunately, we face the daunting task of having to take him to trial all over again.," Watanabe told 10News. "He proved himself to be erratic and dangerous and we will do everything in our power to protect police officers and the community. He will be re-tried. " "I spoke to Officer Brad Hunter’s family. They are discouraged and frustrated by the injustice of having to see Flores in court all over again. Though justice was delayed, they intend to persist until they finally see Flores sent away for good," he added. According to facts laid out in the appellate panel's ruling, Flores was angry at law enforcement following his March 2017 arrest on the gun possession charges. While in jail, he called his girlfriend and told her to claim she owned the guns, since she didn't have a prior felony conviction, the ruling states. He also said the officers "harassed and mocked him" and swore "that when he was released he would go after the people who were responsible," according to the ruling. 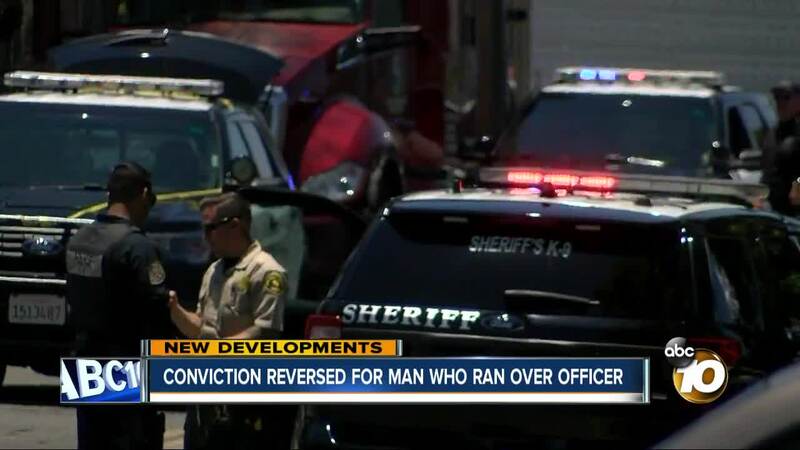 On June 19, Hunter, a 29-year veteran of the department, was struck while pulling over a driver for an expired registration near Oceanside Boulevard and Foussat Road. Flores, who was not involved in the traffic stop, allegedly accelerated and veered directly into Hunter, scooping him up and flipping him over the defendant's car. Hunter suffered head injuries and his leg was broken in three places. The officer had to be placed in a coma until swelling on the brain subsided. Hunter testified he has no memory of the crash. Flores sped away but was captured a few minutes later, Watanabe said. Once in a jail cell, Flores told a sheriff's detective posing as an inmate and a confidential informant that he intended to hit Hunter and wasn't sorry about it, according to the prosecutor. "He (Flores) said, `I got one. I got one,"' Watanabe said, referring to the defendant hitting a police officer. The appellate court based its ruling on McCoy v Louisiana, a case recently ruled on by the U.S. Supreme Court. In that case, Robert McCoy was accused of murdering three of his wife's family members. While McCoy sought to maintain his innocence at trial, his attorney pursued a defense that involved admitting to the killings. In a bid to avoid the death penalty, McCoy's attorney argued that the defendant suffered from severe mental issues, and pursued a second-degree murder conviction instead. Jurors recommended death sentences, but McCoy's convictions were overturned and a new trial was ordered.